You finished with your little soliloquy? Because I’m tired. 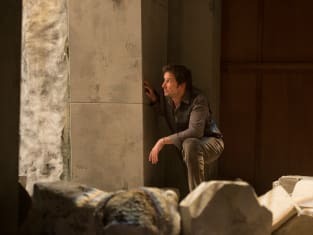 The Librarians Season 3 Episode 10: "And the Wrath of Chaos"
Permalink: You finished with your little soliloquy? Because I’m tired. General Rockwell: You don’t just expect me to hand [the artifacts] over, do you? Jake: You really think after what you’ve seen today that they’re safest with you? Cassandra: I’m sure you’ll do a great job taking care of the Loch Ness monster! Ezekiel: And no one will accidentally open up Pandora’s box! Jenkins: Or touches Midas’s hand. Flynn [pointedly]: Or open up an Egyptian god’s sarcophagus and end up becoming possessed. Permalink: Or open up an Egyptian god’s sarcophagus and end up becoming possessed.